Honey moonshine tastes just as good as it sounds, especially when you do everything right. Fortunately for the novice distiller, a proper honey moonshine isn’t that hard to make. It all boils down (no pun intended) to sourcing a really tasty kind of honey, fermenting it with a strong yeast, and distilling it well to retain most of the honey’s delicate flavor. 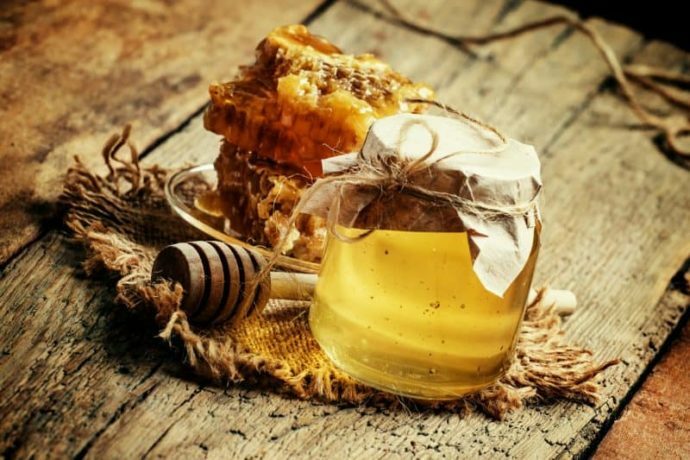 This is a great recipe to experiment with multiple runs and play around with different types of honey and different kinds of yeast to get a wide range of tastes with your honey moonshine. The bees won't know what hit 'em! Heat 2.5 gallons of water to 120°F. Add 1 gallon of honey and stir until completely dissolved. Mix honey water with 2.5 gallons of 70°F water, the resulting temperature being around 95°F. Let mix cool to 70°F or below, transfer to fermentation bucket, then add the yeast and nutrient. Close the lid, put airlock in place, and let ferment at 70° F for at least 2 weeks. After fermentation is complete let settle for 5 to 7 days. Transfer the wash to moonshine still using siphon tube, leaving any sediment in the fermenter. Distill and collect all the cuts as you normally would. Using yeast nutrient is recommended since it will help the yeast to process all the sugars in the honey into alcohol. When mixing honey with water make sure that no lumps or layering takes place, everything has to be uniform for fermentation. The final proof and flavor will largely depend on the type of still you use, though we’d recommend shooting for a slightly lower proof in order to retain more delicate honey flavor. How much yeast do you use?